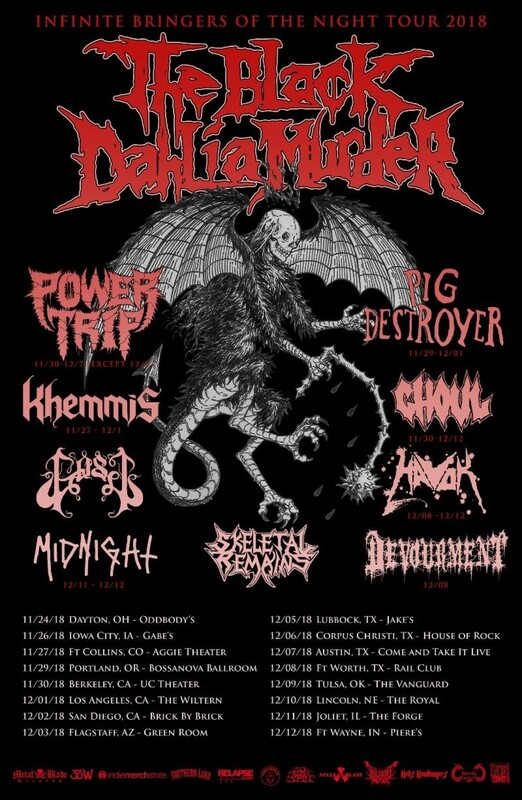 THE BLACK DAHLIA MURDER will be touring in support of their latest album, Nightbringers, which was released to critical acclaim last fall via Metal Blade Records. In the hands of guitarist Brian Eschbach – who co-founded the band with frontman Trevor Strnad in 2001 – and new recruit Brandon Ellis (Arsis, ex-Cannabis Corpse), Nightbringers is rich with dynamic riffs that are at once fresh and classic THE BLACK DAHLIA MURDER, resulting in a collection that shifts through many moods and effortlessly incorporates various elements of extreme metal. To preview and purchase Nightbringers, visit: metalblade.com/tbdm.